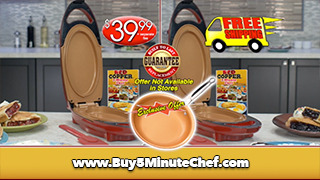 Red Copper™ 5 Minute Chef™ | Official Site | The Amazing Non-Stick Cooker That'll Cook Your Meal In 5 Minutes Or Less! Makes Cooking Meals Faster Than Preheating An Oven! Just pour the ingredients in, close the lid, and the food is ready in minutes. The non-stick surface makes clean up so easy, just wipe it clean! Folding and flipping food in a frying pan is messy, and if done incorrectly, can result in your meal being flipped over the edge of the pan. What a mess! Your flipping fails are about to become a thing of the past. Red Copper™ 5 Minute Chef is the kitchen wonder that cooks your food in minutes! READ FULL DESCRIPTION Designed with two deep wells, it cooks the top and bottom of your food simultaneously. Red Copper™ 5 Minute Chef is infused with pure copper and anti-scratch technology to withstand the toughest punishment. There are no sticky messes because everything slides right out! Cooking your meal is quicker than takeout with Red Copper™ 5 Minute Chef. And it is smaller than a toaster oven. It cooks beef and pork juicy while cutting cooking times in half. Even make stuffed fried chicken with no fuss and no mess. Tackle quick desserts, sear sirloin, and fry hash browns. Red Copper™ 5 Minute Chef even bakes biscuits quicker than preheating an oven! A perfect solution for quick breakfasts and late-night studying in the dorm! Forget about your flipping flubs. Let Red Copper™ 5 Minute Chef do the work for you! Get the Red Copper™ 5 Minute Chef for only $39.99 and pay no shipping and handling! You'll also receive the spatula and Recipe Guide at no additional cost. But wait! Take advantage of our special offer and get a second Red Copper™ 5 Minute Chef, spatula, recipe guide, and the fliptastic Red Copper Flipwich™ sandwich Pan. Just pay a separate fee of $29.99. Hurry and place your order now! 5 Minute Chef cooks your food from the top and bottom so your meal is evenly cooked! Simply pour in your ingredients and close the lid; your food will be ready in minutes! It's infused with 100% copper and can withstand the toughest punishment. Food slides right off 5 Minute Chef's Non-Stick surface!